To Sum It Up: Cate Cahill and her sisters are hiding a dangerous secret. They are witches living in a community that punishes those suspected of using magic by sentencing them to hard labor on a prison ship or shipping them off to an asylum. Since her mother’s death, Cate has assumed responsibility for protecting her younger sisters, but this is not an easy task, especially with Cate quickly approaching the age at which she will either have to get married or enter a convent and join the Sisterhood. A mysterious letter warning her that she and her sisters are in great peril leads Cate to find her mother’s diary and with it a shocking prophecy that could tear her family apart. Review: Because I love a good historical fiction read every once in a while, books set in a historic time period with a paranormal twist to them are especially appealing to me. 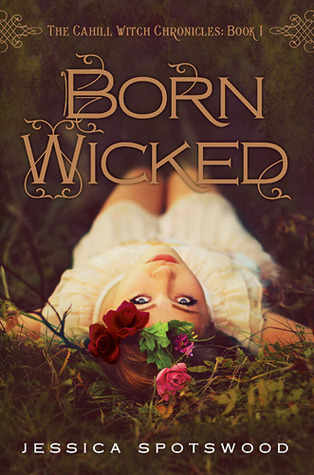 I had high hopes for Born Wicked, which is set in an alternate version of late 19th century New England, but I ended up disappointed. I just couldn’t buy into this world, and there wasn’t enough magic to really draw me into the story. The book’s narration attempts to capture a manner of speaking consistent with its time period, but it doesn’t always succeed. The rather abrupt shifting between wording that was supposed to be contemporary with the book’s setting and more modern sounding language became distracting to me after a while. I wasn’t fully convinced that Cate inhabited a world filled with afternoon tea socials, calling cards, and petticoats. Overall, I thought that the book had a choppy rhythm, and I had a tough time getting past it. I didn’t really connect with any of the characters, either. Cate’s idea of protecting her sisters pretty much amounts to bossing them around. I don’t doubt that she loves her sisters and means well, but her methods of dealing with them need a serious rethink. I did not like the middle sister, Maura, at all; she was a brat with a bad attitude. My favorite sister was the youngest one, Tess. She showed some pluck that would have made Cate a far more interesting heroine. I think that I would have liked the book better if it had been told through Tess’s eyes. Most of the action in Born Wicked doesn’t take place until about 2/3 of the way through the book, and even then, it’s not that heart-pounding. I understand that the Cahill sisters are trying to keep their magical abilities a secret to avoid a horrible fate and so cannot perform magic openly. I still think that the novel could have benefited from the sisters using their powers more, though. In a book about witches, I expect to see a fair amount of spell casting, and that doesn’t really happen here. Still, this might be worth a read if you’re interested in Puritan New England and the Salem Witch Trials, albeit with several creative liberties taken. All in All: This wasn’t a standout read for me, so I won’t be continuing with the series. I do hope that Tess plays a larger role in the sequels, though; she’s a character to keep an eye out for. I have this on my sheld waiting to be read. It does sound interesting but i might have to wait awhile before i pick it up. I was looking forward to it. I did have different expectations about what the book was going to be like compared to how the story turned out. This was one of those books that just didn't work out for me. I'm glad to hear that you enjoyed reading it, though! Oh I'm sorry it wasn't for you. I have it in my TBR pile and O really need to try it some day. I'm curious to see if I'll think the same thing. Definitely give it a read and see what you think. This book fell short for me, but there are a lot of readers who did like it. Interesting. To be honest, I got pretty bored with this one and ended up DNF'ing it on page 100 :/ Well, I did skim through to the end to see what happened. I agree with you about the spell casting thing, there was hardly any witch-y stuff going on at all! Rather disappointing. I really didn't care for Paul; there was something in his attitude that I found off-putting. I liked Finn a lot more; I thought that he, along with Tess, was one of the better developed characters in the book.